Carlo Knud Hansen. Denmark. Oil on canvas. Harbor Scene. Signed: C.K. Hansen. Measures: 61 cm x 50 cm. The frame measures: 10 cm. In very good condition. Knud Nedergaard modernist landscape. Oil on canvas. Signed KN. 1970s. Measures: 90 cm. x 70 cm. The frame measures 10 cm. In very good condition. 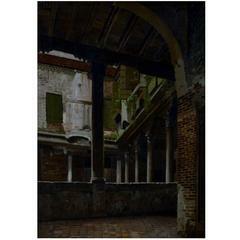 I. T. Hansen (after) F. W. Doberck, 19th century Venice, exterior, San Gregorio church. Oil on canvas. Measures 29 x 22 cm. The frame measures 5 cm. In good condition. Provencal landscape large format. French school Baudin signed late 19th canvas. James Carlin Listed American Artist (1906-2005) bar scene oil on canvas in a wood Frame. Measures: 30 x 40. Canal scene oil on canvas painting signed. Nicely detailed in a gilt frame. Unframed H 11", W 15". Late 19th century rural scene. Farm buildings, animals, mountains, etc. Some minor repairs as shown at back. Offered at ,. Painting of lower Manhattan docks with cubist vessels juxtaposed. Giltwood frame. Not signed.